If you follow along with the Search Centered blog, you already know that Google My Business reviews are the most important type of online reviews for your business. Facebook business pages come in as the second most important place businesses in most industries should aim to collect reviews. With more than 1.5 billion daily users on Facebook, it is much easier to get your customers to leave you a review on Facebook, than it is on Google My Business. Why are Facebook business reviews important? With Google My Business reviews it is easy to understand why reviews are important – Google controls the internet and they see content/reviews on their own site as important to their users. Customers reviews on your Google My Business listing goes to reinforce that your business actually does offer the services and products to customers that you say you do on your website. The same is true with Facebook business reviews. Google does not exist in a vacuum. While Google does like it’s own content, it also pulls from other reliable sources to validate and confirm the quality of the information that has been directly provided via reviews of your business on your Google My Business listing. Facebook is valuable in this regard because users must create an account to use the social media network. This means that a review is much more likely to be written by a real person, rather than a fake review or bot. Industry experts estimate that only 5% of Facebook profiles are fake. In comparison, some experts estimate that 1/3 of all Twitter traffic is from fake accounts, bots, or spammers. Again, this means people are more likely to use their real identity on Facebook and use their real identity when writing a review of your business. A real review from a real person – that’s the key. The more likely a review is real, the more value search engines will give it, meaning the more search engine optimization (SEO) value it has, eventually leading to higher search rankings (with all other things SEO being equal). As with Google My Business customer reviews, the first step is to ask your customers to leave you a review – and make it easy for them to do so. When a customer is logged in on Facebook, they see the easy to use review form immediately. Your customers must be logged into Facebook to leave a review of your business on your Facebook page. If the customer is not logged in, they will be asked to login, before writing their review. 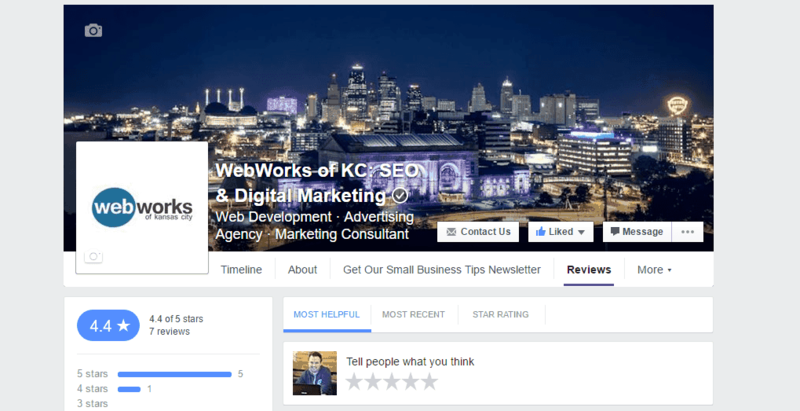 Getting your Facebook business page review form link is MUCH more simple than getting a direct link to the review form for your Google My Business listing. 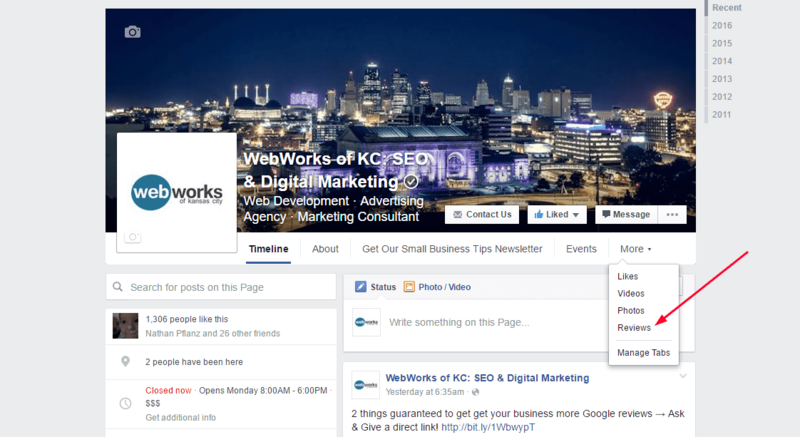 Login to Facebook, and go to your Facebook business page. Now that you’ve done all the hard work: get the customer, make the customer happy, there’s only one thing left. Ask for the review. My advice is to keep it short and sweet. You’ve already made the customer happy – you don’t want to turn that all around by annoying them now. Would you mind taking a moment to leave Search Centered a short and honest review on our Facebook page? Another tactic we use is to simply send a text message to the client, including the review form link. Of course this takes a little more finesse, but if you regularly text with clients, this method is an even quicker way to get that review. What if your customer doesn’t have a Facebook account? As mentioned above, your customer must have a Facebook account to be able to write a review of your business. At Search Centered, we know that our clients DO have a Facebook account, because we assist each client with creating their Facebook business page. Of course, this isn’t always the case for the customers of many other businesses. Hopefully, you are asking happy customers to leave a review of your business, so they would be happy to leave you a review on another website if they don’t have a Facebook account. If your customers don’t have a Facebook page, ask for a review on your other profiles, like your Google My Business listing, Yelp, Angie’s List, Amazon (for products), Open Table (for restaurants), TripAdvisor (for travel and entertainment), or at very least send you a testimonial via email that you can add on your website. Happy customers are happy to help out businesses they love. Ultimately, I recommend that you get a minimum of 5 reviews on your Google My Business listing before asking for reviews on other platforms. Right now, Google My Business reviews will have the most impact on the SEO aspect of your business website. No matter where you would like your customers to review your business online – Start asking for reviews and top it off by making it even more simple for customers to review your business. Tell me about your success with Facebook business reviews in the comments below!